Love to chat guys, but I got dinner to eat and a Game 4 to watch. Day Nine – Halfway There! Today I managed to squeeze in just under eight thousand words. I got up this morning and decided I needed to go all out. Before that I took care of cleaning my room up a bit. I also had to take care of laundry. To help perk my brain up, I went out to the gym. A nice run on the elliptical machine got my heart going. After a filling lunch, I jumped right back on the computer and got off to a slow start. As time went on and I found more heart-pumping songs to listen to, I managed to hit four thousand by the early evening. Took an hour break to clear my head and munch on some dark chocolate and hydrate myself. Fueled and ready to write, I added another three thousand words. It helps I’m at a key point in the story. But some scenes I had to write were…a bit awkward to say the least. By dinner time I was at seven thousand words. 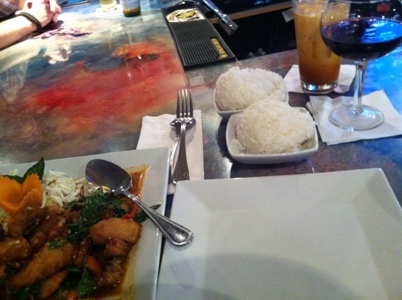 I drove down to my favorite Thai face and watched Game 7 of the NBA East Finals. Nail-biter that game was. By the time I came home, I realized I had less than an hour to write some hour and make this blog post. I managed to squeeze in just under a thousand words in about thirty minutes. With my word count at the half-way mark for Camp NaNoWriMo I decided to call it a night. I know next weekeend will not be as productive, so I’m glad to have hit a good milestone.